Chemotherapy can increase cancer growth by damaging the DNA of nearby healthy cells. Researchers found "evidence of DNA damage" in healthy cells after chemotherapy treatment. Scientists recently published this report in Nature Medicine. Cancer cells metabolize sugar differently than do healthy cells. Cancer cells cannot absorb oxygen like healthy cells and it is this low oxygen level that proves to be the key factor in cancer growth. Most cells and most proteins in blood are glycosylated; that is, they are coated with sugars. This coating of glycoprotein receptor sites form the operating system (OS) for your cells and the body communication system including translating and transcribing DNA. The damaged DNA excites the healthy cells to secrete a protein that sustains tumor growth and cause resistance to further chemotherapy. 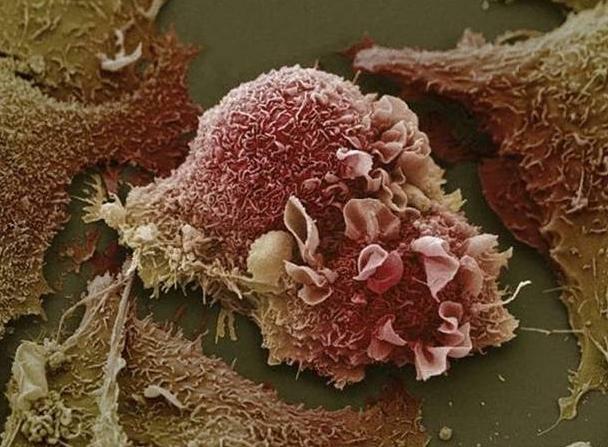 The damaged DNA requests WNT16B protein which is then used to boost the cancer cell survival. Other studies have shown that fermentation of sugar, because of lack of oxygen, allows the cancer cells to lose all beneficial function. Cancer with the highest fermentation rate has the highest growth rate producing only putrid toxic waste because the cell cannot metabolize further without oxygen. The WNT16B study was seeking to explain why cancer cells are so easy to kill in the lab, yet so resilient inside the human body. Healthy tissue collected from men with prostate cancer showed evidence of DNA damage following chemotherapy. The team confirmed and then reconfirmed their findings with breast and ovarian cancer tumors. Co-author of the study, Peter Nelson of the Fred Hutchinson Cancer Research Center in Seattle stated, "The increase in WNT16B was completely unexpected." These findings were "completely unexpected". Nelson explained, "WNT16B (protein), when secreted, would interact with nearby tumor cells and cause them to grow, invade, and importantly, resist subsequent therapy." Tumors often respond well with chemotherapy initially; but, is normally followed by rapid regrowth, prior to developing resistance to further treatment. Oncologists know this danger; but now they know why: the WNT16B protein. Cancer cells crave sugar. Sugars that are easy to ferment feed cancer while some Smart Sugars resist cancer and build a powerful immune defense system. My hypotheses is that cancer cells "mow down glycoproteins " on the surface of neighboring cells, thus weakening or killing their signaling capabilities. This reverse glycosylation (stripping away the glycoprotein receptor sites) leaves the cell naked and defenseless, unable to summon help to correct the situation. It cannot receive the proper care and feeding, so cancer spreads as it produces a more acid/toxic environment. Smart Sugars coat healthy cells like fuzz on a peach; however, cancer cells are depleted of glycoproteins. Healthy cells have a forest of glycoproteins while cancer cells are void of this living forest. The future of medicine and healthcare is in evaluating glycoproteins by literally counting and determining the quality of these receptor sites. Medical science will gather worlds of data through the soon to be Gold Standard of medical diagnostics to determine if the cells are healthy, bald, or balding. The age-old question is: "Is the glass half full or half empty?" Is that really important? Just fill the glass!" Do we treat the cancer, enable the cancer, or prevent the presence of cancer simply by growing more glycoprotein receptor sites. We now have scientific evidence that oral consumption of Smart Sugars can and do improve glycosylation in the human body. References from the textbook Expand Your Mind - Improve Your Brain and the ebook and Change Your Sugar, Change Your Life. The book, Change Your Sugar, Change Your Life is downloadable without charge. Source: can be located on the website for The Endowment for Medical Research.